There is a lot of text coming. I am sorry. 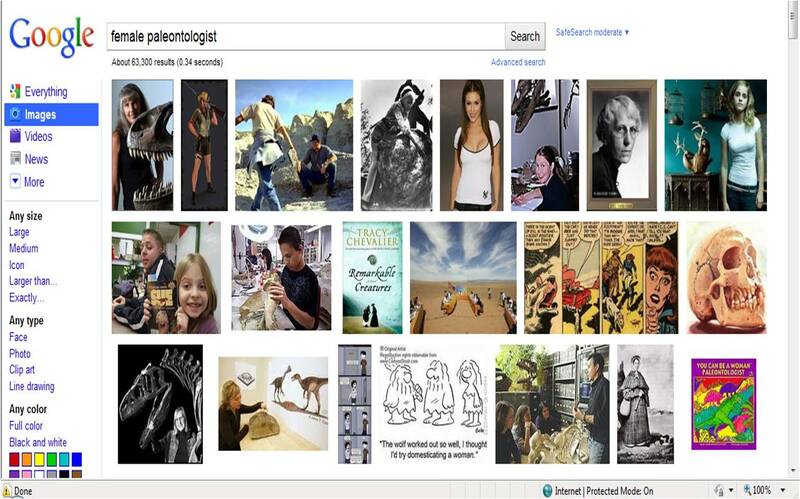 Here is a screenshot of the first page of Google Images when you search ‘female paleontologist’. I find most of the results baffling. Actually, I think you may be the first woman in history to name a valid new pterosaur (Natasha Bakhurina's “Phobetor parvus” being recently sunk into _Noripterus complicidens_). Can any pterosaur experts confirm or deny? Kind of interesting to note that if you search “Male paleontologist” on google, you get images of female paleontologists! Though some women might disagree with me (sorry), I'm pretty confident that we're now well past the stage when the media chooses, or doesn't choose, people because of gender (or ethnicity, for that matter). In fact, TV people are often keen to feature women because they want to appear balanced. Where it's women who have done the research that the media people are interested in, those women get featured. I told the Dangerous people about your research on ankylosaur clubs (I know I wasn't the only person to do this): your gender was irrelevant. As more and more women get into palaeontology (and science in general), we should expect to see better representation – at the moment, it's true that whole fields do remain male-heavy (I don't want to say 'male dominated' as it's not as if we male people are deliberately trying to exclude the other gender). As someone out side of the paleontology field. I am surprised by what you consider “popular media.” If you asked me about a female paleontologist in popular media, my first (and probably only thought) would be Laura Dern's character from Jurassic park. I am waiting for the day when I feel my favorite 6 year old girl is old enough to watch this movie. Because she loves dinosaurs and I can't wait to watch it with her. Hi folks – thanks for all of the interesting perspectives! A few comments: As Lisa pointed out, women may be less likely to be confident public speakers – it would be interesting to see if there are any studies that support that generalization. If that is the case, it would then be interesting to know why! Darren mentioned that media folks are probably not choosing men over women – I think that's probably true for the most part. However, if you're a media person and someone says 'get me a palaeontologist! ', then you will probably think of a select few high-profile palaeontologists, who are all men, and approach them for your show/article/website/whatever. And as I said, I was somewhat surprised to hear repeatedly over the last few weeks that people were surprised to see a female palaeontologist! To clarify: I'm not suggesting that SVP favours male speakers over female – what may be happening is that female palaeontologists are not requesting to give talks at the same frequency as male palaeontologists. I am also pretty sure there has to be greater than 10% female dinosaur people in North America. One of these days I will do a post about the women of the Polish-Mongolian Palaeontological Expedition. Darren – then my thank-you goes to you and any others! As to waiting for a six-year-old to be mature enough to see “Jurassic Park,” I may be a bad parent but when my daughter was 3 it was her favorite movie. And she applauded when the T rex saved the day by attacking the velociraptors. Hi Ian – thanks for the comment. It's great that you were inspired early on by a documentary that had a female palaeontologist featured, and it's great to hear that you have many female colleagues. But as I've mentioned, there are lots of female graduate students in palaeontology, but that isn't necessarily translating into female palaeontologists in the media (or female palaeontologists as faculty members, for that matter). Hopefully this will continue to improve!